Do you have a passion for painting and visual art? Looking to develop your own personal visual language and to gain exhibiting experience? Join the Faculty of Fine Arts and Music's Visual Art Studio: Contemporary Painting, take your skills to the next level and publicly exhibit your artwork! 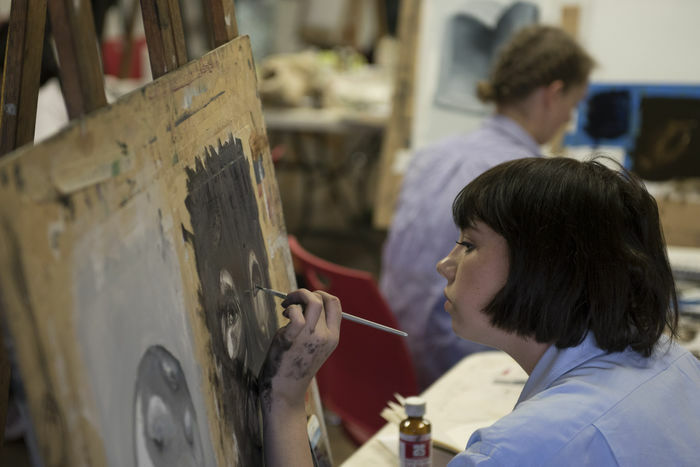 Located in the arts precinct at Southbank, this intensive part-time year-long course is designed to provide adults who have completed Visual Art Studio: Painting Techniques with a foundation in the practice and study of fine art. The Visual Art Studio: Contemporary Painting course will provide you with the opportunity to develop painting projects that incorporate new ideas and techniques, with the supportive and critical encouragement of your tutor, practicing artist and educator. The class explores a wide range of practical methods including the use of oil, acrylic, ink and watercolour paint as well as the preparation of a variety of painting surfaces including canvas, wood and paper. You will gain an understanding of the myriad of ways artists, of both national and international significance, are working with painting today. Harness your passion and develop your fundamental skills, artistic knowledge, relationship with contemporary art, ability to work independently and explore your own artwork at your own level. The program culminates in an end-of-year exhibition, where students have the opportunity to publicly exhibit the artwork they have created. Completion of Painting Techniques or some previous experience in visual art practice is recommended. This course is suitable for 18+ year-olds.